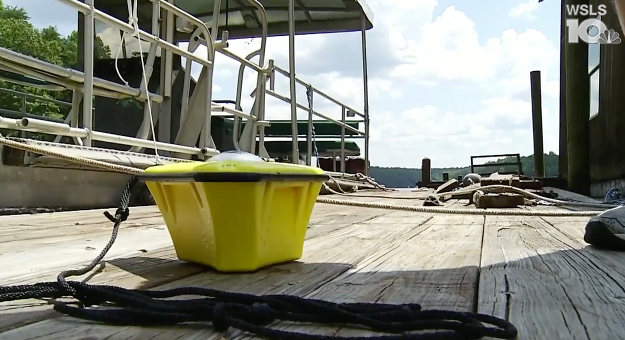 MONETA, Va. – First responders are warning about a big problem in the water that’s completely invisible and could be deadly. “You can’t see… (but) as soon as you get in the water, you get hit with the electricity” SML Marine Volunteer Fire Rescue Firefighter Neil Harrington said. That’s what Smith Mountain Lake Marine Volunteer Fire Rescue crews say they’re seeing at some docks around the lake. “I’m sure there’s a lot of facilities around the lake that were wired back 50 years ago or 30 years ago that probably need to upgrade their wiring,” Harrington said. Infrastructure deteriorates over time, exposing wires and potentially putting electric current into the water. “Typically what you’ll feel is a tingling sensation, which is the only warning that you get as you’re approaching the source of the electricity. If you were to go in right at the source of electricity, you’ll be electrocuted instantly,” Harrington said. That’s why Harrington is using a new device, which detects electricity flowing through the water. “Any amount of electricity is too much for me. I don’t want to come into contact with electricity and the water,” Harrington said.